The managing partner admires women who do it all. F&W teamed up with Toklas Society to spotlight top women in food and drink. Use #FOODWINEWOMEN on Twitter (@foodandwine) to follow along and share your best tips. What She Does: Ali does everything. She created (conceptualized, designed, built and now operates) Haven's Kitchen and is an active board member of Edible Schoolyard NYC, Just Food and Food and Environmental Reporting Network. Last but certainly not least, she also raises five children. Women who have so many meaningful things on their plates really inspire me and remind me what a privilege it is to love what you do. As a working mother myself, I look to women like Ali to keep me going, to reinforce the idea that we can be great moms and still have a meaningful career and make the world a better place. Signature Accomplishment: Haven’s Kitchen is such a special place. It exudes the hospitality, passion and sensibility that are uniquely Ali. It feels like you’re being welcomed into her home when you step through the door. What Sets Her Apart: There are many things that set Ali apart, but one thing that stands out to me is that she comes to this business from a different angle, a fresh perspective—not by working in kitchens or waiting tables—and has become such a well-respected voice among chefs, restaurateurs and food policy advocates because she genuinely cares and connects with people. Why She Is Amazing: Ali is amazing because she’s building bridges. She believes so strongly in educating people about food, how to prepare it, where it comes from, why it matters. She believes that food brings people together, and she provides a venue and a school where she does just that. Everyone I have brought to HK and introduced to Ali has been blown away by what she has created. What She Does: Kate manages the development of our new brands from a graphic-design, Web-design and tabletop perspective and is responsible for maintaining the consistency of our existing brands. She also designs and creates the content for all of our digital outreach. Signature Accomplishment: While Kate studied fine arts in college, she is self-taught on the digital creative programs. She has literally developed her skill set in parallel with our needs. What Sets Her Apart: We pride ourselves on “hiring people, not positions,” and Kate represents such a great reason to do just that. I’m not sure who initially made the decision to hire her, but I am grateful that they did. Kate came to us five years ago and joined our guest relations team as a reservationist. She quickly became lead reservationist, then reservations manager and eventually transitioned into a position as my assistant. When Kate started working with me more closely, we were in the midst of opening a few new projects, and it became clear that she understood Craft’s point of view on design and marketing as well as anyone. Since then, as our restaurant group has grown and evolved, we’ve been spending a lot of time thinking about brand identity and digital marketing, and Kate has taken it upon herself to develop the skills to make her an invaluable part of our team. Why She’s Amazing: People who work behind the scenes in restaurants rarely get much recognition outside the walls of their businesses but often work just as hard as the chefs or sommeliers who get the glory. 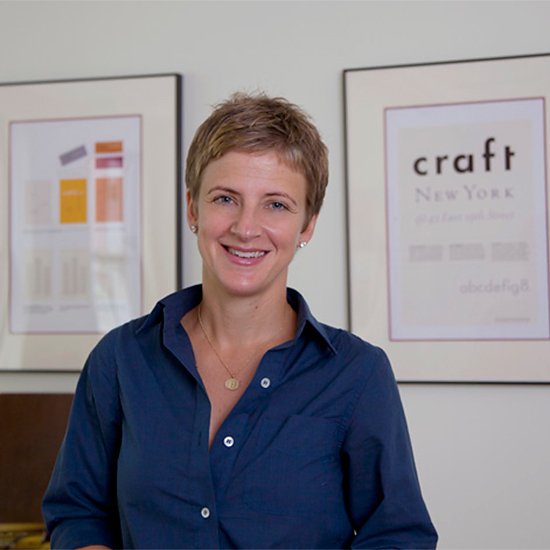 Kate is smart and creative and works quietly and tirelessly to bring each vision to reality. She fully embodies our Crafted Hospitality vision and voice and is respected by everyone who comes into contact with her. KATIE GRIECO BIO: With a passion for cooking and hospitality at an early age, Katie Grieco began working with Tom Colicchio as his personal assistant at Gramercy Tavern after graduating from Princeton and, later, Cornell’s Hospitality Management Program. Two and a half years later, Colicchio asked Katie to oversee the construction of his new restaurant, Craft, and act as general manager. Since the opening of Craft in 2001, Katie has developed and managed Craftbar and Colicchio & Sons in New York City, Craftsteaks at the MGM Grand in Las Vegas and Foxwoods, an additional Craft in Los Angeles, Heritage Steak at the Mirage in Las Vegas and most recently, Beachcraft at 1 Hotel South Beach. She is now managing partner in charge of operations and new project development for the company with the responsibility of developing and overseeing all restaurants. Katie received a Women of Achievement Award from the Century City Chamber of Commerce in 2008 for her work as a professional, a community servant and a mother. In 2010, she was named to Crain’s “40 Under Forty” list of dynamic New Yorkers who excel in their fields.